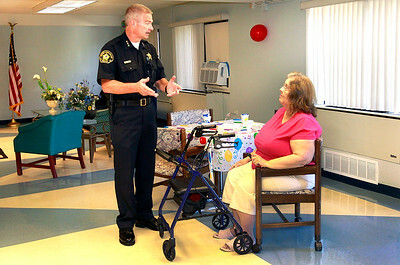 Candace H. Johnson - For Shaw Media Round Lake Beach Police Chief David Hare talks with resident Barbara Mejia during the Police and Fire Appreciation Lunch at the Beach Haven Tower Apartments in Round Lake Beach. 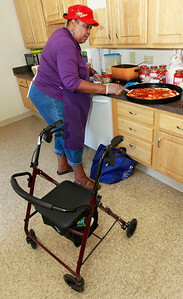 Candace H. Johnson - For Shaw Media Resident Caline Stroter makes pizzas for the Police and Fire Appreciation Lunch at the Beach Haven Tower Apartments in Round Lake Beach. 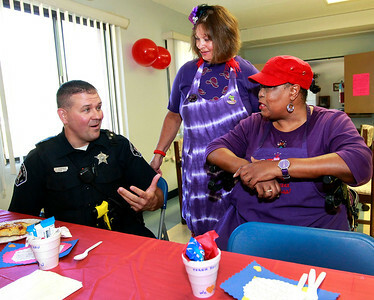 Candace H. Johnson Patrol Officer Steve Sandacz, with the Round Lake Beach Police Dept., talks with Kathy Simon, of Ingleside, and resident, Caline Stroter, during the Police and Fire Appreciation Lunch at the Beach Haven Tower Apartments in Round Lake Beach. 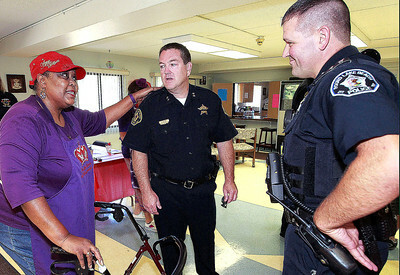 Candace H. Johnson - For Shaw Media Resident Caline Stroter talks with Round Lake Beach Police Deputy Chief Mike Scott (left) and Patrol Officer Steve Sandacz, during the Police and Fire Appreciation Lunch at the Beach Haven Tower Apartments in Round Lake Beach. 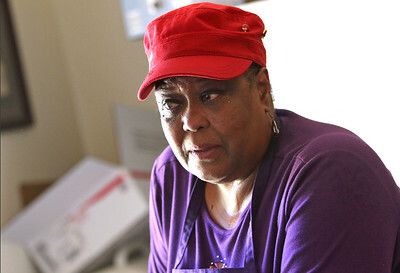 Candace H. Johnson - For Shaw Media Resident Caline Stroter reflects on how the police and fire departments have helped her during the Police and Fire Appreciation Lunch at the Beach Haven Tower Apartments in Round Lake Beach. 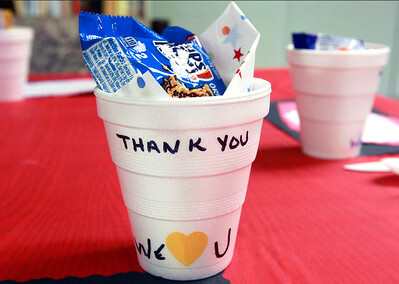 Candace H. Johnson - For Shaw Media A cup full of sweets sits on a table during the Police and Fire Appreciation Lunch at the Beach Haven Tower Apartments in Round Lake Beach. 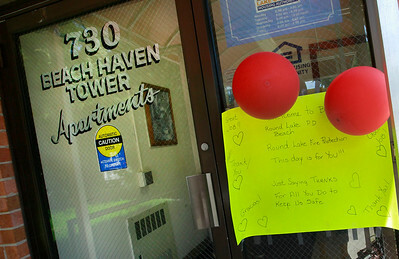 Candace H. Johnson A thank you sign hangs on the door for the Police and Fire Appreciation Lunch at the Beach Haven Tower Apartments in Round Lake Beach.